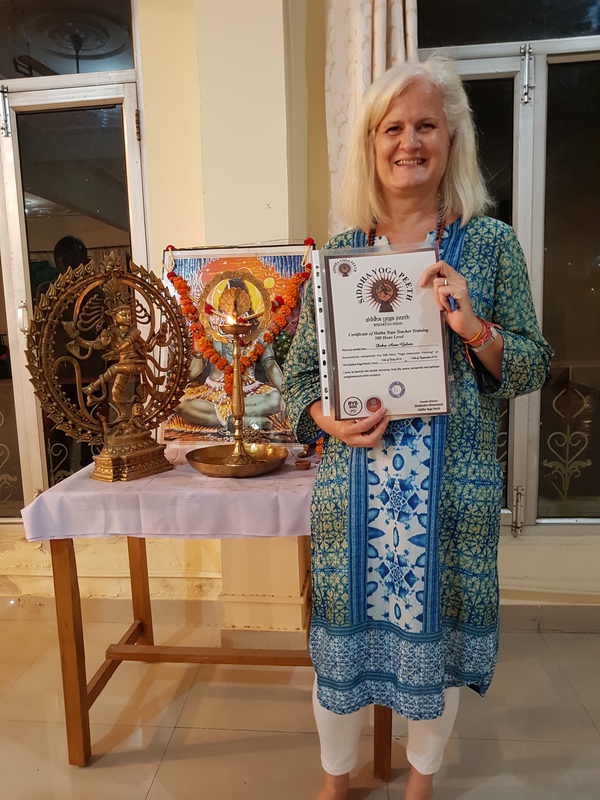 India was always my chosen destination for a Yoga Teacher Training course and my super-star husband Mike made it a reality this July – September. The 500-hour course was my birthday present. Based on Internet reviews and feedback, he chose, from the myriad ashrams, Shiva Yoga Peeth. I flew from Abu Dhabi to New Delhi. An hour’s internal flight then transported me to my pre-arranged taxi at Jolly Grant airport, Dehradun. Forty-three kilometres later, I arrived at Shiva Yoga Peeth in Jonk, Rishikesh. 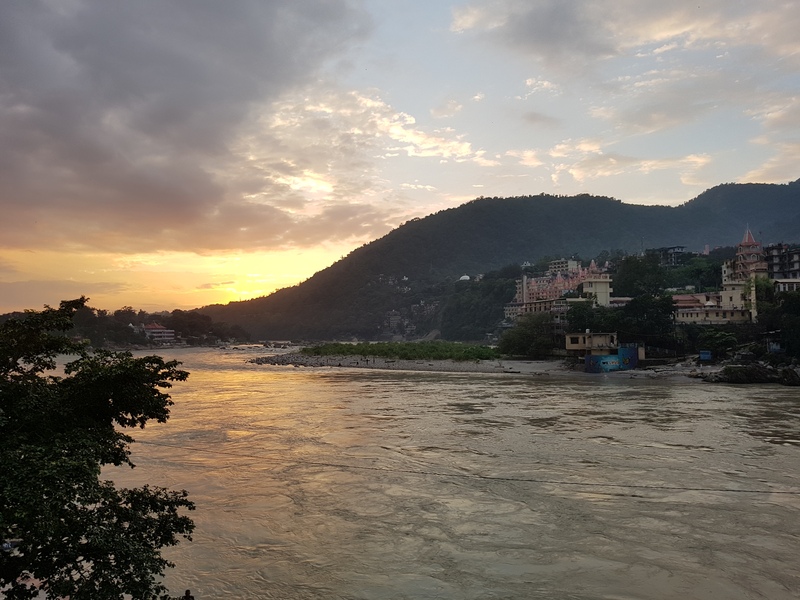 Located in Uttarakhand (Northern State) and nestled in the Himalayan foothills, Rishikesh is known as the Yoga Capital of the World. It is a Hindu holy place – a special place to visit in search of higher self-knowledge. Its global claim to fame is, of course, The Beatles visit to Yogi Maharishi Mahesh’s ashram – a must see! Keen on studying yoga in India? Click here to read our updated guide to Indian Yoga Visa. The friendly, efficient and flexible staff completed my check-in and payment. Soon I was settled at Ganga View Guest House, conveniently located adjacent to the school and my home for the next four weeks (200-hours). Most students were housed at the Diva Hotel within walking distance of the school and some others at the school itself, to where I relocated once I began my 300-hour course. My room and ensuite bathroom (at both locations) met my basic needs. I brought along my open heart and mind as the school suggested and immediately resolved not to fuss about things I knew were only short-term in my life. In the big picture, my ‘western world’ expectations lost their significance. I adapted as necessary: folded blankets helped soften a hard mattress; a headlamp provided light during unexpected power failures. These minor inconveniences taught me to appreciate more what I take so for granted. There were complaints (sometimes justified) but somehow complaining seemed contrary to the authenticity! The Shiva Yoga Peeth staff handled students’ complaints with a smile and a good heart! Getting back to the big picture, what an experience I had. I attended the course in July 2018, which is the rainy season with unpredictable torrential storms, rapidly rising river levels and fast flowing street rivers, delighted me, since I live in a desert. I did consult an Ayurvedic doctor who gave me digestion medicine to take while I was there. Having seen beautiful pictures of Mother Ganga out of Monsoon season, I believe another visit is on the cards! I absorbed the Hindu festivals’ energy: the auspicious Guru Purnima, joyous Ganesh Chaturthi and spiritual Ganga Aarti. I lovingly watched my diya (floating flowers and candle bowl) bobbing along in the holy river’s current taking my wishes along. I sipped hot mint tea and indulged in vegan chocolate. During my time in Rishikesh, there was a religious pilgrimage to Neelkanth Temple which brought a lot of ‘orange people’ through Rishikesh but it added to the experience of being there. Weekends seemed to be busier and certain times of the day. I went out selectively. I’ve not been there out of Monsoon season so can’t really compare how busy it would be at other times. Also, the course fees of the YTT is the same regardless of the season. I appreciated Rajendra’s invigorating marma massage and Dr Kothari’s patient Ayurvedic hot poultice treatment which released my chronic back tension – so grateful. I stood in cow poo (twice) and made friends with curious cows and unconditionally loving street-dogs. My close monkey-encounters, terrifying at the time, make great hindsight-stories. I bought books. I learned infinitely from the international smorgasbord of fellow students – supportive, encouraging, humorous and special – and forever bonded by this shared experience! Sharing began with an engaging fire ceremony held in one of the two halls where the 200 and 300-hour courses are run simultaneously and ended with a happy celebration. The perfect view of Mother Ganga, the mountains and the Lakshman suspension bridge from the halls, forms a spectacular backdrop to all activities. There are plenty of bolsters, cushions, blankets, mats and blocks for students – beginner to experienced teachers. The daily schedules included: two yoga sessions – Ashtanga (morning) and Hatha (afternoon); Pranayama; Anatomy; Philosophy; Meditation and Self-Practice. The 300-hour also included Alignment. The teachers, fonts of all yogic knowledge – dedicated, disciplined and diligent – were always approachable. A Sunday excursion to Temple Kunjapuri was also included. Click here to read out 10 tips while applying for a YTT in India. I faced challenges galore: foreign accents; nine weeks away from home; physical exhaustion and stiffness; sitting on the floor for all lessons; completing 108 Sun Salutations (twice) and icy Ganga dips (not me); pronouncing and recalling Sanskrit numbers, mantras and asanas’ names; feeding rubber tubes up my nostrils; fighting my ego; sticking to a Sattvic diet – by choice mind you as I saw it as a detox opportunity: it worked (lost 4kg). There are delightful restaurants in close proximity – Little Buddha Café, Bella View and The Sunset Café to name a few – when I was tempted. One point to raise is the ATM situation as the machines are a fair distance from the ashram. Some shops accept card payments and, for a percentage charge, some will let you draw cash from your credit card but if you need cash money it’s best to think ahead – especially when it’s busy as the machines quickly run out of money. I tried 6 machines one day and had no luck! Nine intense weeks later, a T-shirt, a Rudraksha-seed mala and a 500-hour Certificate of Teacher Training are proof I have done it! But, my yoga journey is only beginning. I am filled with joy and humility at the prospect. Thank you to all the beautiful people at Shiva Yoga Peeth who contributed to this life-changing experience. My comfort zone boundaries were pushed beyond their limits but I emerged transformed, enlightened and enthusiastic to share what I have learned. And Sidharth’s words will forever echo in my mind, not only on my yoga mat but with each breath I take: only ujjayi will help me! Debra Galvin’s yoga practice started at the London Sivananda Yoga Vedanta Centre many years ago. She recently completed her 500 Hr Yoga Teacher Training in July 2015 at the Shiva Yoga Peet in Rishikesh. For more information on Shiva Yoga Peet click here.